Seattube/toptube cluster. This is immediately after brazing and still has a load of flux residue on it. 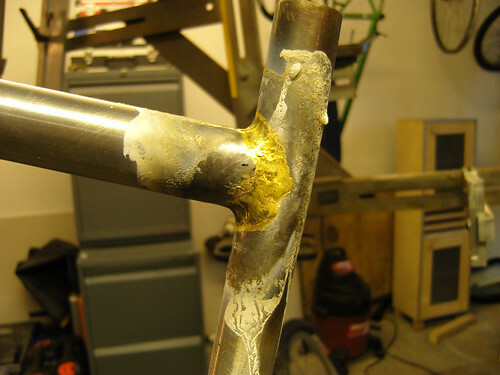 The flux is applied before brazing as a paste and hardens to a crusty crystalised coating during the brazing process. I use water soluble flux so a couple of hours of soaking in the dunk tank and it washes clean off. Once it’s finished the soak, we do a little filing and sanding to create a nice smooth even fillet. This is a pretty good braze so it’ll need hardly any finishing.